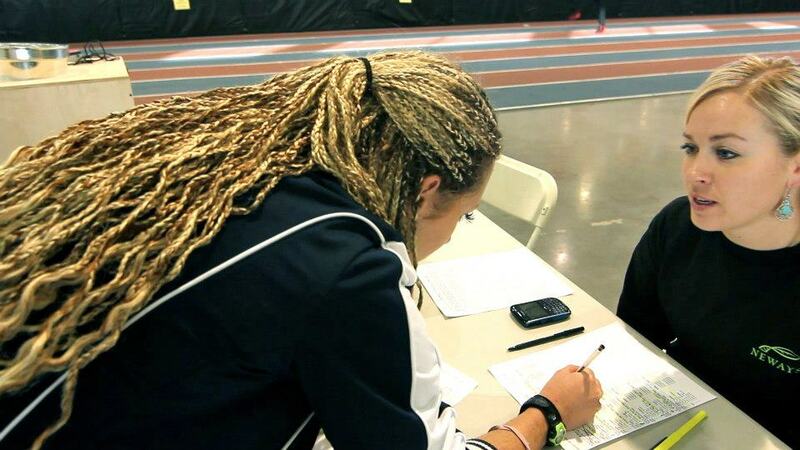 Runners from area high schools and colleges have been invited to compete in the second annual GoldenSprint Challenge Invitational, Feb. 23, at the legendary Utah Olympic Oval. In this track and field event, sprinters will compete in the 60 meters, 200 meters, 400 meters sprints, and the 60 meters hurdles race. The name of the meet, “GoldenSprint,” is one of Frimpong’s nicknames he earned when racing as an illegal African immigrant in the Netherlands. His Dutch coaches gave him golden track shoes after his first Dutch National win. The fastest men’s and women’s sprinters at the GoldenSprint Challenge will follow Frimpong’s footsteps and take home a golden spikes trophy. Top colleges and high schools in the state, including UVU, BYU, Davis High, Riverton High, Herriman High and Alta High will be attending the event. 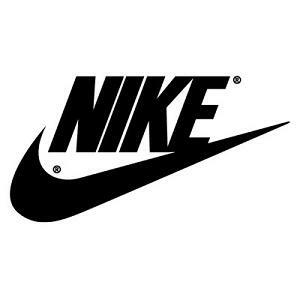 The GoldenSprint Challenge Invitational has quickly gained recognition and support from businesses in the area and international brands, including Nike, Wal-Mart, Neways Inc., Carrabba’s Italian Grill, The Utah Olympic Oval, Runner’s Corner, and McGees Stamp & Trophy. 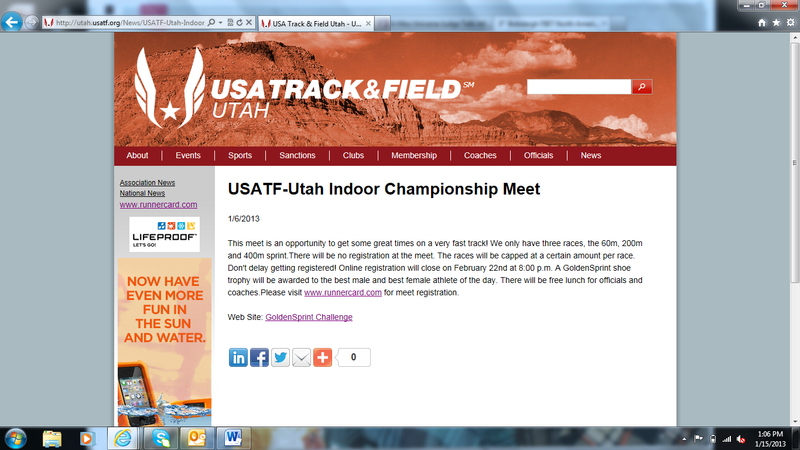 The track meet has also been selected as the 2013 USATF-Utah Association Indoor Track & Field Championship. The GoldenSprint Challenge will be hosted on Feb. 23 from 10 a.m. to 1 p.m. at the Utah Olympic Oval, 5662 S. Cougar Lane in Kearns. The proceeds from the event benefit the Utah Special Olympics. To register for the meet, visit www.goldensprintchallenge.com. For more information, call Akwasi Frimpong at 801-494-3060 or Robin Bryant, USATF meet director, at 801-636-3949. Information can also be obtained by emailing goldensprintchallenge@gmail.com. High school athletes, college, masters, and unattached athletes will compete in same events per gender except in the 60m hurdles. Registration is $10 per race and will only be accepted online. registered! Online registration will close on February 22nd at 8:00 p.m.
female athlete of the day. There will be free lunch for officials and coaches. school’s apparel. Disregarding this information can cause eligibility problems. Proceeds benefit the Utah Special Olympics. Registration is $10 per race and will only be accepted online. Registration at the meet will be $20 per race. The races will be capped at a certain amount per race (and it’s filling up already). Don’t delay getting registered! Online registration will close on February 22nd at 8:00 p.m. Click here to register. It is going to be a fun and competitive track meet. Again don’t delay getting registered! 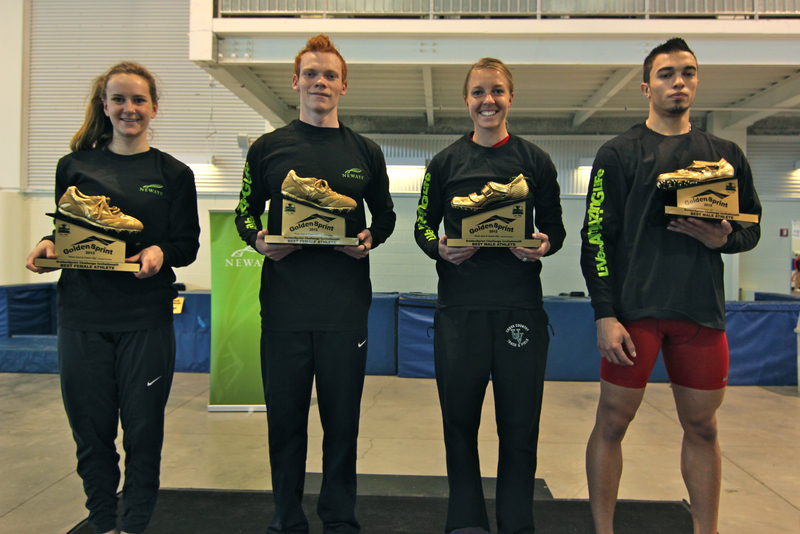 The 2nd Annual GoldenSprint Challenge Invitational has been selected as the 2013 USATF-Utah Association Indoor Track & Field Championship. We have decided to add the 60m hurdles to the program; after requests from coaches and athletes.